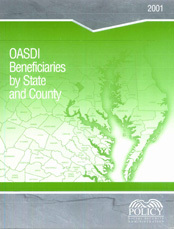 This annual publication focuses on the Social Security beneficiary population at the local level. It presents basic program data on the number and type of beneficiaries and the amount of benefits paid in each state and county. It also shows the numbers of men and women aged 65 or older receiving benefits. This report is a useful planning aid for Social Security Administration (SSA) field offices and for those providing information to federal, state, and local government agencies. Some Social Security beneficiaries have a representative payee—a person designated by SSA to receive their monthly benefit when such action is in the beneficiary's best interest. About 4 percent of all adult beneficiaries and virtually all child beneficiaries under age 18 have representative payees. For most children, the representative payee is the parent with whom the child resides. For beneficiaries with representative payees, the state and county designations are those of the representative payees, not those of the beneficiaries. After the numbers have been rounded, the dollar amounts in Table 5 are proportionately adjusted upward or downward, as appropriate. Cherice H. Jefferies in the Division of Retirement, Survivors, and Disability Insurance (RSDI) Statistics and Analysis programmed and compiled the data for this report.